So Saturday was a blast. Most of are circle of friends were back from home. The weather outside was frightful so we decided to stay in and have some fun. 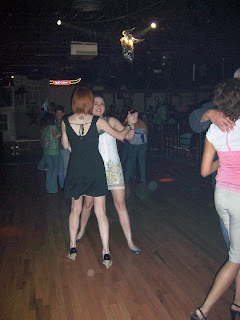 Which included some good drinks, music, and dancing. As Airman in the Dorm's or more like studio apartments. (Don't really like calling them the dorm's feels like I'm in college.) We have a good circle of friends we stick together and always have a good time. 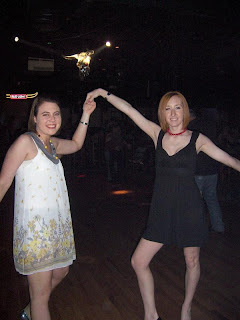 So we danced and drinked the nigh t away as responsible 20-somethings. Yes that is me singing into the remote control, hey I didn't have a microphone and that was the next best thing. And yes I am standing on my chair I was singing to my favorite song! I guess it was so good I needed a stage lol. We airman know how to have a good time and not have to spend a lot of $$. Oh and this all took place in my room by the way. It was my turn. we all take turns it helps with trying to keep are rooms clean. I recommend buying a few boards games like Apples to Apples or Loaded Questions. Both great party games. They never get old. In honor of Black Friday I bought some Black clothes on sale at Nordstrom, my favorite store and a weakness of mine. I went to the mall in Overland Park, KS. This place is huge. I don't get many chances to come here. Mostly because I am a Airman in the AF and we don't make a lot of money at all. Plus I'm trying to save up for Christmas. So when I go I give my self an allowance to spend. This time it was only $100! Which really isn't a lot but I managed. I had been wanting this Black long pea coat, but I was waiting for it to go on sale. Usually it's $125 or so and today I got it for $58 bucks. Now that's what I call a deal. Then as I was looking around I found this dress I had been wanting. It is a black knit dress. I had been kind of looking for one for awhile but hadn't find the perfect one that would go with my suede boots. Well there it was my size waiting for me to find it. Plus that was on sale for $30. I bought some grey tights to wear with it. So I stayed within my shopping budget and left a very happy woman. Oh and got to eat at the Rain Forest Cafe, which is always a fun place to eat at. Today is Thanksgiving. But it's not just Thanksgiving for me but it's one year signing my enlistment papers for the U.S Air Force. I have a lot to be thankful for this past year. Not only have I started a new journey in my life but I now have goals in life and have learned a lot about myself and I'm starting to discover who I am. 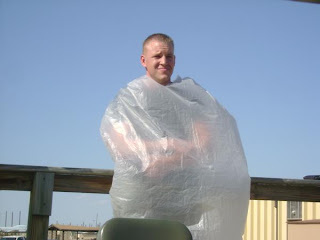 I decided to join the Air Force back in September of 2007. 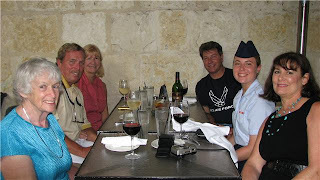 I had a good friend Ken Ellard a retired helicopter pilot officer for the Army. He had passed away the previous month. He was like a grandpa for me. He was a big inspiration to my life and always told me that I could do anything I put my mind too. He always talked very highly of the Military and all of the great things that it had to offer. Well when he passed away he had told Rod to watch over me and make sure I did something great with my life. Rod is a special person in my life. He has been there every step of the way in my new military life. Without his help I'm not sure if I would have made it all the way. 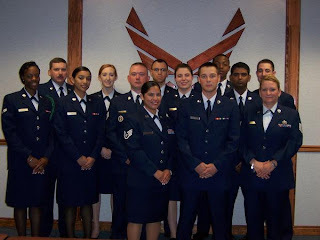 So it's December 07, and I was in this program called "DEP" (delayed entry program) . 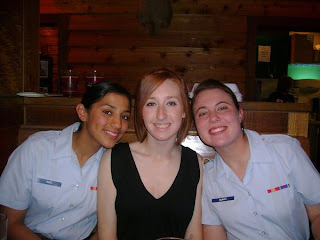 I wasn't planned to leave for basic in May of 2008, but I wasn't sure if I was going to be able to wait that long. I was very anxious about getting started. So my recruiter put me on a Quick ship list. So first available opening I could take and go to Basic. Well I had a friend in the program who I met along the way. 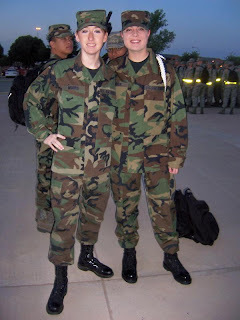 We both wanted to go to Basic together so we would know someone. Well she was leaving in February to go and I still hadn't heard a word when I was going. Well in the mean time I was packing my things up and putting them in storage just in case I got that call. Well the morning that call finally came. It was February 12 and my recruiter Tsgt Costely told me to get my bag together that i was leaving today!! Oh my was hit with so many emotions at one time I was excited, nervous, excited and scared. But I rushed around got everything I needed to go. Rod picked me up and I was on my way to meet Tsgt Costley. So once Rod dropped me off I was on my way to Denver to sign papers and get taken out of DEP and swear back in to Active Duty. 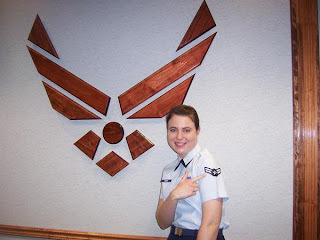 So the next day when I took the oath of enlistment I was leaving on a jet plane to head down to a little place called Lackland Air Force Base in San Antonio, Texas. I was really nervous about it and when I got there I was scared out of my mind. I woke up to reality real quick. It was the toughest experience in my life. I was put in many situations I had never experienced before. Most of it was just a head game the T.I's loved to mess with your mind to see if you would crack. I'm not gonna lie I cried almost everyday until the end but I made it strong. I graduated on March 28, 2008. That was a wonderful day actually the day before was great because I got to see some of my family for the 1st time! It was very exciting. Well the next step through this exciting journey was Tech School. My school was at Sheppard AFB. Which is in Wichita Falls, Tx. So they put us on a bus early Monday morning and sent us on are way. We all slept the whole way there. Finally Sleep. When we finally got there 8 hours later are MTL's were there to meet us and tell us we are safe no more yelling and crazy people lol. They showed us around the base and let us get settled in. We of course headed right for chow. We were starving airman who finally get to sit down and eat a meal at chow and not get yelled out and take as long as we wanted too. The only hard part about tech school was not getting any sleep at all. We were lucky on the week days if we had 4 hours of sleep, that was worse then basic. But we made up for it on the weekends. I made some really good friends in tech school. One is Sam.i.am she is my wing man for life. Her and i have the same job so we were in the same class. Diaz was also in are class. Sam.i.am is the one in civy's. 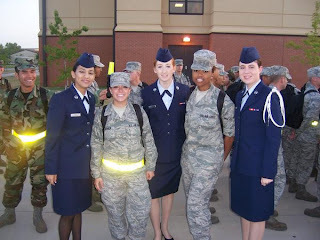 She was ahead of us on the phase programs and we still had to wear are blues off base. 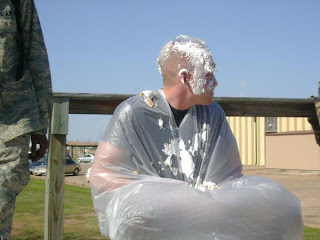 In tech school I was also a white rope, It meant i was like a chaplain student leader. Hint the white rope on my shoulder. 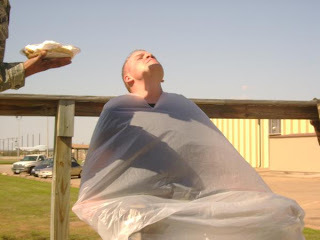 Friday afternoon's were like squadron meetings like are CC would come out and talk to us and tell us to be smart over the weekend well sometimes we get to have revenge over the MTL's something like Pie in the face. Well we had this really cute MTL. No need for anymore words the pictures will show it all. Tech School for me was only a month long and it went by pretty fast. Are last week there was lots of fun. Are last weekend all together we had decided to get dressed up and go out. The photo to the right is my mystery pilot man. The was probably the best night of being in tech school. Well the week went by fast and soon came graduation on Friday May 9th. 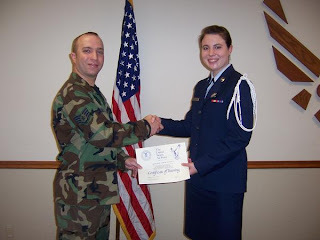 Also the day i put my rank on. Two strips, Airman First-Class. So after graduation I got all my paper work done and Rod was here to pick me up and take me home to Colorado! Finally three and half months later I was free. So I made it all the way. I got the hardest part out of the way. I had never been so proud of myself. So today I have a lot to be thankful for. My family and friends and my career. There will be more to come soon. So I hope this is a good start. Good night.